Completely furnished 1BR/1BA apartment with deck in Washington, D.C. 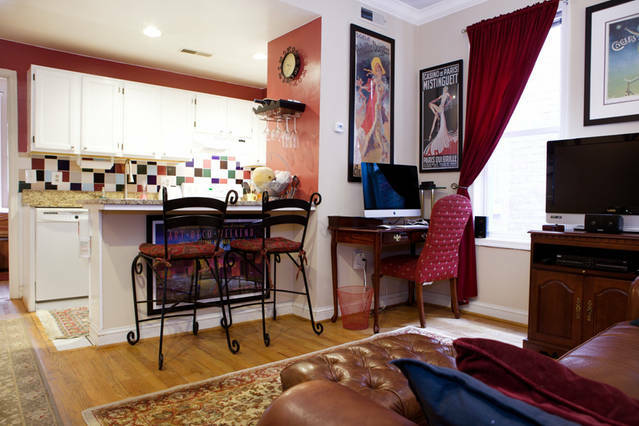 Apartment Suite 5 is a completely furnished 1 Bedroom / 1 Bathroom apartment with an outdoor deck located in the Adams Morgan neighborhood of Washington, D.C. at $2,900.00/month. From this convenient Adams Morgan location, you’ll walk to Metro, live music, great eateries and more. We prefer a 90-day minimum lease but other terms may be negotiated. Please note: Our Summer term from May to 31 August requires a minimum 90-day lease. This elegantly furnished 1BR/1BA apartment with deck, table and chairs, is considered one of the best units in the building–located on the second floor, rear of the building and away from traffic and other street noise. The apartment boasts approximately 650 square feet (see the link to floor plan below) and is nicely decorated and tastefully furnished with many items from The Bombay Company. The space is perfect for one person yet will accommodate two comfortably. Ceilings are 10′ tall and pronounced with crown molding and recessed LED lighting. There is adequate natural light throughout the unit with hardwood flooring and ceramic tiles in the kitchen and bathroom. Guest entry is securely controlled by an intercom access system. The living area has a chic and very comfortable leather sleeper sofa (pulls out to full-size bed), leather ottoman, and a Queen Anne style writing desk and chair. For entertainment, there is a 32″ High Definition (HD) flat screen TV with multiple HDMI ports and access to YouTube TV’s Washington, D.C. channels via Xfinity’s blazing fast Cable Broadband. This service is included in the rent. Do you still have CDs, DVDs, or enjoy local radio? Everything sounds great coming from a surround sound home theater system. Because we are conveniently located (one block away) between two very popular grocery stores (Harris Teeter and Safeway) we’ve configured our kitchens to prepare and serve most any meal. This apartment’s kitchen is newly remodeled with granite counter tops and new appliances. The combined living and kitchen area is joined by an “eat-in” counter space with comfortable bar stools. There’s a full complement of pots and pans, glasses (water, juice, and wine), dinner and flatware. Other kitchen accessories include: refrigerator, garbage disposal, dishwasher, electric oven/range, toaster, coffee maker, microwave oven and yes . . . even a blender! The bedroom area has sandalwood bedroom furniture consisting of a chest of drawers, night table, and a new full-size Sealy Posturepedic mattress set. From the bedroom, you can also access a private deck with table and chairs for quiet relaxation. There is adequate closet space for your hanging and folding items. The apartment is supplied with a complete set of pillows, towels, and linens. If you haven’t determined by now—everything is here! All you need to bring are your clothes and your toothbrush! The unit is equipped with washer/dryer and an iron and ironing board. We also supply every apartment with a vacuum cleaner, cleaning agents/liquids and other cleaning accessories such as sponges, rubber gloves, and brushes. An energy efficient heat pump (central air unit) with digital thermostat provides comfort year-round. Please note: Utilities (electric usage) is NOT part of the rent and will be deducted from security deposit at the end of your stay. All apartments are separately metered; therefore, you only pay for the electric used within your unit. The building and apartment are very energy efficient and your electric bills will strictly be based on your personal level of comfort (thermostat control), how frequently you cook to prepare meals and how often you use the washer/dryer. Recent electric invoices for this unit show approximately $58.00/month during spring and fall months and $88.00/month during winter and summer months. For questions about the Adams Morgan neighborhood, parking, smoking, and pet policy, etc. we encourage you to view the FAQs. To schedule a showing of this Adams Morgan fully furnished 1BR/1BA apartment in Adams Morgan, please call 202.320.7020 or email us: click here. Fully supplied kitchen with everything needed to prepare meals.